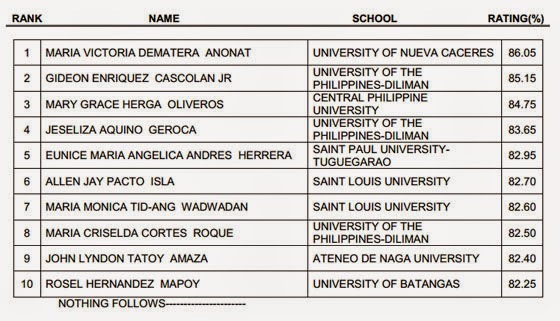 List of passers, top 10 for April 2014 Librarian Licensure Exam - Balita Boss! The Professional Regulation Commission (PRC) announced Tuesday, April 29 that 149 out of 533 passed the April 2014 Librarian Licensure Examination administered by the Board of Librarians in the cities of Manila, Baguio, Cebu, Davao and Legaspi. Librarian Board Exam was conducted April 23 and 24, 2014. University of Nueva Caceres graduate Maria Victoria D. Anonat topped the Librarian Board Exam with a passing rate of 86.05%. View or download the performance of school in the April 2014 Librarian Licensure Examination at prc.gov.ph. Registration for the issuance of Professional Identification Card (ID) and Certificate of Registration will be on May 8 and 9, 2014. The date and venue for the oathtaking ceremony of the new successful examinees in the April 2014 Librarian Licensure Examination will be announced later, the PRC said. April 2014 Librarian licensure exam covers the following subjects: (Day 1) organization, management and maintenance of multi-media based library or information service laws, trends and practices affecting the profession, reference, bibliography and information services and selection and acquisition of multi-media source of information and (Day 2)cataloguing and classification, indexing and abstracting and information technology.